What is more important than definitions and distinctions, is that both the Internet and the Web are used to promote what is referred to as e-commerce - using networks and electronic devices to support buying and selling, and supporting any communication or transaction between a business, their customers, suppliers and other stakeholders. The growth of the web has led to the development of retailers which sell exclusively via the Internet, such as Amazon. However, the Web has also provided existing retailers, such as Staples, with an additional distribution channel. 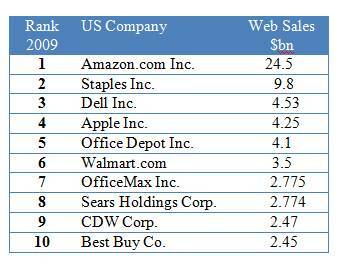 In the US, the 500 e-retailers in the Internet Retailer Top 500Guide for 2009 accounted for 93.7% of all web sales. Perhaps more remarkable is that the top 100 of those merchants control 80.7% of all web sales. While the big players have long been dominant, their dominance is growing. In 2008, the Top 500 accounted for 87.9% and the Top 100, 74.5%. So it appears that established brand identity and economies of scale still provide competitive advantages, even in this new marketplace. Indeed, the big e-retailers are getting bigger. In the next section we look at possible areas where technological change will impact on business.